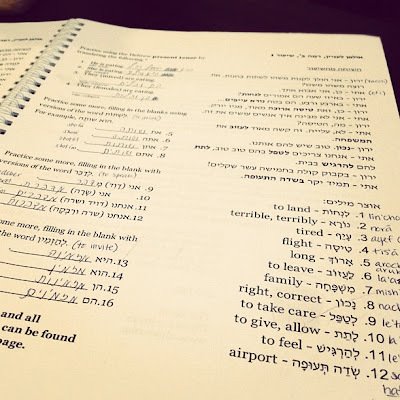 Six weeks ago I started my first Hebrew class (or Ulpan as they call it here.) I'm bound and determined to learn Hebrew and fit in as much as I can. Sure, a lot of Israelis speak English...but it seems like they generally choose NOT to speak English (unless you're buying something from them). That being said, in any social setting, I'm typically the outsider. On my first day, I glided into the building on Allenby 94, looking around curiously for where exactly I was supposed to be. After an hour long bus ride from "home" I was hoping I was in the right place. Buses always seem like more of a challenge than they end up being. But in a new place, I'm always nervous and fidgety despite all the research I've done about which bus to take, how far to take it, how much to pay, etc. As I waited at the bus station, wondering if I was in the wrong place, I finally saw bus 61 bumbling down the road toward me. In a defensive state, to keep from unnecessary embarrassment, I paid with way more cash than I knew it would cost...so that I could get change instead of awkwardly not paying enough or not knowing what the fare was. (Gulp...unfriendly bus drivers are the worst). Then I meandered to the back of the bus...hoping there would be an open seat next to a friendly face. And then I waited, checking my phone for the location every 2 minutes...wondering if I'd already missed my stop, when I knew all and well that it would be at the very least a half hour. So an hour later, I was relieved to find the address of the building I was looking for. I still haven't figured out how the address system works here - it seems that there are no suite #s. Every place I know gives their street address, but not suite. And if there are multiple buildings, entries, or offices you just have to figure out which one it is. I have yet to figure out if there is no existing suite #? Or if they just don't give it out. Lacking confidence that I was in the correct building, I asked the old man tending a watch repair booth on the bottom floor for 'AACI' and luckily he understood enough to point a finger up toward the stairs. On my first day, I wanted to be plenty early so I cruised in a half hour before class started. Naturally, nobody else was there yet. Closer to 4:00 a few students rolled in and I started making conversation. At EXACTLY 4:00 the teacher walked in. Not a minute before, not a minute after. How's that for timing??! My heart filled as I settled in to the comfortable classroom and shot glances around the room at students who seemed equally, if not significantly more nervous than I. The teacher introduced himself as Lioz, and we went around the room taking turns sharing our brief stories. I'd spend the next 3 weeks face to face with these 5 students and teacher for 2 hours every day. So I was relieved when I felt an instant fondness toward each one of them. First there was Dan, an elderly gentleman, hard of hearing and hard of sight. He hailed from Kansas, and he eagerly repeated after our teacher. Because he couldn't hear well, he was nearly shouting, but his enthusiasm and dedication was so endearing and charming that I couldn't help but immediately smile at his presence. Such a sweet man, bless his heart. And then there was June...a sprightly woman from New York. And when I say New York...I mean NEW (you better know it) YORK! Who cares that she left the city 14 years ago...she's carried that pride and character with her throughout the years. 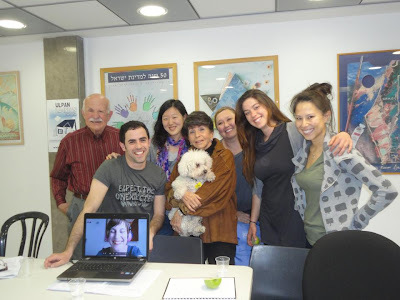 She's been in Israel for over a decade, and has managed to become a successful business woman, and a great community influence, despite her limited Hebrew. (Proof to myself that apparently you CAN survive in this country without speaking the local language). She struck up conversation with me right away - proving herself the naturally outgoing woman I thought she'd be. The others lingered in to the room, a few tardy pupils - lost on their first day. A brilliant, multi-lingual young lady from France, a foreign exchange student from China, and a newly married gal from Louisiana, working in research that was far too scientifically complex for me to understand, or explain here. I followed along studiously in my workbook, and tried my best to repeat after Lioz with the "chhhhh" hacking pronunciation and the guttural rolling of the "r"s. He guaranteed us it would get easier with time, and I could see the Chinese girl's mental eye roll at that statement. Since that first day, I've come a long way. And Lioz (our teacher) was right - my pronunciation has gotten significantly better, or so I'd like to think. And our group in 'Level 1' grew a bit to include some other wonderful characters. We bonded and became our own little Motley crew - sharing our vastly different stories and backgrounds, and appreciating the fact that they all brought us to the same little classroom. I've always been a good student (a true nerd - ask any of my high school friends) and it was refreshing and natural to be back at a desk, repeating after my teacher and noting my homework, rather than staring down a computer and punching functions into Excel. I am so thankful for the opportunity to be a student again...to be learning and challenging myself. I'm trying to exude "Sponge Bob" now...absorbing as much Hebrew as I can, listening to nearly incomprehensible TV, and speaking (mostly to myself) in Hebrew. Learning isn't easy...it requires you to stretch your mind, expand your horizons, and free up brain space to accept new information. But it's so enriching! Today I challenge you to open yourself up to learn something new. Sign up for that cooking class you've always wanted to take, or the computer skills course, or youtube a piano lesson on a song you've wanted to learn to play (impressively, my brother taught himself how to play piano with this method). Whatever the commitment is, be it big or small, open yourself up to discovering something new. There are few things that automatically brighten my morning like sun streaming through the window. Granted, I have black out blinds (God's gift to earth...especially when in Vegas) so I have to snap the shutters open before I can see the beautiful sun. But as soon as I do, I perk up, jump out of bed, and am ready to start my day (or afternoon as it turns out today). Hey...it's my Saturday so I'm allowed to sleep in! I skipped into the kitchen (the whole 2 steps away) and started to make lunch to go. I plopped my iPod into the speakers and nodded away as Florence and the Machine brought me back to wonderful summer days with friends in Seattle at the lake, dock, cabin, or near any body of water really. 1. Sandwiches taste surprisingly good with ketchup on them. When he first said ketchup - I couldn't wrap my head around the bizarre request. What? Who puts KETCHUP on a SANDWICH?...weirdo. Turns out it actually tastes pretty good. In theory it works...I mean, we put it on hamburgers (and baconburgers) which are bread and meat, so why not sandwiches that are bread and meat? 2. In reference to my inability to make a decision on which "path" in life to follow...he told me to start doing SOMETHING. Even if it's something small. The fear of doing something that's not perfect is holding me back from doing anything at all. And it's far better do something imperfect, and make some progress, and open up possibilities...rather than sit motionless paralyzed by the fear that it won't be my BEST work ever. Motivation can be hard to come by when you're debilitated by your own high expectations. But 'doing' is better than 'thinking about doing'. Today is the day to do. Pack your lunch, turn on some tunes, head out into the world (even if you're in Seattle and there's no sun) and take a step toward achieving your goals...even if it's not a perfect step.